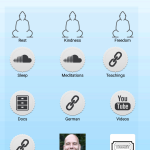 My two podcast “Natural Meditation podcast” and “Reines Gewahrsein” are available on many podcast apps, like iTunes, Stitcher, Tuneln Radio, Apple podcast, and others. I prefer Pocket Casts, a podcast app available on iOS and Android. You can listen to “Natural Meditation podcast” directly on Soundcloud. It is possible to download the episodes from the website. They have a nice app for your smartphone. My German podcast “Reines Gewahrsein” is available on Hearthis. They have an app as well. Both Podcasts are available on Spotify: Reines Gewahrsein on Spotify and Natural Meditation podcast on Spotify.